Like many men playing in baseball’s independent leagues, 28-year-old Casey Logan Haerther began his professional career with a Major League franchise. Casey was drafted out of Chaminade College Preparatory School in West Hills, California, by the San Diego Padres, in the 35th round of the 2006 draft. Electing instead to attend UCLA, he was selected again after his junior year, this time in the 5th round of the 2009 draft by the local Los Angeles Angels of Anaheim. By 2012, he was playing at the Double-A level with the Arkansas Travelers, where he finished second on the teafm in hits (132), home runs (10), total bases (185), and RBI (56). At the end of the season, Casey played for Team Israel in the World Baseball Classic qualifiers. 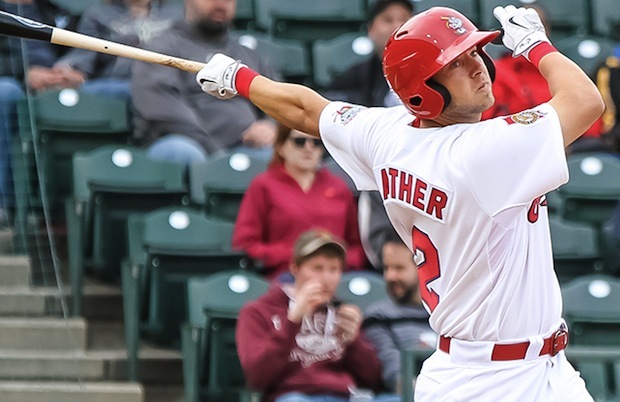 Six months later, however, the kid brother of former St. Louis Cardinals prospect Cody Haerther was released by the Angels organization. That is when he made his way to the Winnipeg Goldeyes of the American Association of Independent Professional Baseball Leagues. In three years with Winnipeg, Casey has batted .326 with an OPS of .836. He has averaged more than 72 RBI each year in 98 games per season. A multiple award winner — player of the week, player of the month — Casey was voted by league managers and media members to the league’s postseason All-Star team in 2014 after posting a .360 batting average and .535 slugging percentage. He was a postseason All-Star again in 2015 with a career-high 79 RBI. The 6’2″ first baseman is versatile, playing third base on occasion and even doubling as an emergency pitcher. In 2015, he faced 10 batters, striking out three, and while he gave up four hits, he did not surrender a walk or a run. On July 21, 2015, JBN correspondent Zev Ben Avigdor met with Casey during batting practice at St. Paul’s CHS Field and talked about playing the game, Team Israel, and what makes a good fan. Following is an edited transcript. Haerther: I’ve been playing ball since I was seven years old, just trying to follow in my brother’s footsteps. He’s a few years older than I am. My parents aren’t really athletes at all, so I don’t know how my brother and I did it, but we did it. I was fortunate enough to get drafted out of high school, but I had a scholarship to UCLA, so I didn’t go with the San Diego Padres out of high school, and I went to college. I was there for three years and had a great time, and I was fortunate enough to get drafted in the fifth round by the Angels, and I played with them for five years and got released. I made it up to Double-A and played with a lot of big leaguers who are around today, like Mike Trout and Garrett Richards and Randal Grichuk. Those are just a few of the bigger names. I got released in 2013, and came to Winnipeg to play baseball, and I’ve enjoyed it. It’s not the same as affiliated ball, but it’s still good baseball. I got picked up by the Orioles after the 2014 year. I went to spring training with them and got released. Here I am today. It’s been a lot of baseball. It’s been fun. You get to meet a lot of people, travel the world—it’s better than sitting behind a desk. This past winter I played in Nicaragua, in Chinandega [see article]. That was fun. I’ve played in Mexico a little bit. You get to see the country. You see how baseball is in different parts of the world. It’s fun. JBN: Along the way, you’ve had Jewish teammates. At UCLA you played with Cody Decker, and then you played for Team Israel. Who are you in touch with these days? Haerther: I would say Cody Decker probably the most. I’ve talked, and other forms of communication, with Joc Pederson. I’ve congratulated him on the All-Star Game and all of his success. Who else have I kept in contact with? That’s the thing with baseball. You all kind of go your separate ways once it’s done. It was a lot of fun playing for [Israel]. It’s just, Decker I’ve known him since I was 18 years old, in college. We’ve sort of grown up together. He’s had a pretty good career so far. He’s just looking for that one break. The WBC was definitely a highlight of my career. Really fun to be a part of that. JBN: What did you like the best about playing for Team Israel? Haerther: I think just being around the guys. Being around Brad Ausmus before he got the Detroit [Tigers] job. Shawn Green, Gabe Kapler, [Mark] Loretta. All those guys. You definitely feel like you’re in a big-league environment. It was definitely a lot of fun. JBN: Are you still in touch with Shawn? Haerther: No, I haven’t talked to Shawn [recently]. I talked to him during the WBC. The year I got released I talked to Shawn a little bit, in 2013… I’m not really the type of guy to bother people when it comes to myself. It was just a privilege to be able to play with him, to be honest with you. It’s funny, Reggie Abercrombie was just telling a story about his first big league camp, and he was with the Dodgers, and Shawn Green was around, and just how quiet and humble Shawn was, and I just reiterated how I felt about him, too. He’s just quiet, humble. You would never know what an amazing career the guy had. Wrote a good book a while ago [The Way of Baseball: Finding Stillness at 95 mph ]. It’s a real good book. JBN: And now Kapler is with the Dodgers. Haerther: Yeah, he’s their farm director, minor league farm guy. He’s moved up. JBN: Did you have a chance to interact with him? Haerther: A little bit, nothing too much. He’s definitely moving up in the baseball operations department. He runs it differently. Casio Grider, he’s on the team [Winnipeg]. He had the privilege of being released by Gabe Kapler. But having said that, it’s a different side of him. He’s trying to bring a lot of different aspects of baseball to the Dodgers. New Age baseball is all statistics-based, so the game is definitely changing. I’m trying to think of more [Team Israel] guys I’m in touch with. Charlie Cutler. I’ve talked with Cutler a little bit. He’s a good guy. One of my buddies I used to play with in the Angels organization a long time, Matt Long, is in Triple-A with Milwaukee. He’s playing with Ben Guez. They’re in Colorado Springs. Nate Freiman. I saw him a little bit. Jack Marder. He had to retire because of concussions. He had to retire about two years ago. They wouldn’t clear him to play anymore because of concussions. He played with the Mariners [franchise]. He was good, too. There’s a bunch of guys who were on [Team Israel] who have a real chance to play in the big leagues. But obviously Joc is going to have the best and the longest career of anyone from there. He’s just an amazing talent. What he can do on the field is hard to accomplish. It was fun to watch the  Home Run Derby. Pretty impressive. What is he, 22? 23? He’s not that old. Pretty cool. When I played with him, how old was he, 19? 20? JBN: When you were drafted out of high school, did you consider signing? Haerther: Yeah, it’s everyone’s dream. Because my brother signed out of high school, that was always my dream. But when it came down to it, and the money wasn’t what I wanted it to be, I guess I reluctantly went to UCLA, but obviously looking back at it, I would’ve wanted to go to UCLA the whole time. It was just an amazing experience, baseball-wise and academically. You meet friends that you still have, in college. Baseball friends, they come and they go. You’re on one team, you’re on the next team, but college friends you have relationships with them, and it’s fun. I’m still a little short of my degree. I’m slowly getting it. I took a few classes in the off-season. I haven’t had the chance to go back full-time during the winter, just because I’ve had instructs a few years, winter ball, things like that. Obviously, it’s every kid’s dream to play professional baseball as soon as you can. [But] I really think college is a great thing for kids. More and more college kids are getting drafted higher. It’s a lot quicker way to the big leagues than coming out of high school. JBN: After the WBC, the fact that you are Jewish became more well-known. Did fans approach you more? Haerther: Yeah, you would get more fan mail from Jewish people looking for autographs and things like that, or at the field. They would start saying, “Hey, I’m Jewish, you played on Team Israel,” that sort of thing. You’re definitely more well-known in the community. Most of the time autograph seekers or people in general don’t really talk about things like that. They just want your autograph and say thank you and goodbye, but you definitely get more people saying you’re Jewish, maybe asking a few more questions. JBN: What’s it like in Winnipeg? You have a Jewish owner who was born in Israel. Haerther: Yeah, Sam Katz. He was the mayor [of Winnipeg] forever. This is the first year he wasn’t the mayor. This year, I gave him one of my Team Israel jerseys, because we had two of them. I gave him one of those. He was really appreciative, and he liked it. He takes really good care of me and the team as a whole. It was just one of those gestures that I thought would be nice. Winnipeg’s awesome. You get 5,000, 6,000 [fans] a game. Obviously, Canada’s a hockey country, but when we’re in town, the community loves it. They come out in support. We have a beautiful ballpark [Shaw Park]. I’m sitting at a 70-million dollar ballpark right now [St. Paul’s CHS Field], so it’s hard to compare, but it’s beautiful, and everyone has always said for a long time that if you’re going to play independent baseball, there are only three or four places you would go, and they always say Winnipeg is one of them, so I’m happy to be there. Obviously, when I got picked up by the Orioles I had other plans for the season, but things didn’t happen the way I thought, so I’m back here. JBN: Winnipeg has a somewhat sizable Jewish community. Have you had any contact? Haerther: Yeah, there’s one guy I talk to. He’s kind of become one of my friends there. He’s Jewish. Sam’s talked with me about [the Winnipeg Jewish community] a little bit, but we haven’t gone into much detail about it. JBN: No rabbis coming by and trying to get you to lay tefillin? Haerther: Nothing. They don’t have baseball temple, they only have ‘baseball chapel.’ They do baseball chapel here [in the American Association]. I think it’s run by the same organization that does it for [affiliated] minor-league baseball. JBN: What else would you like the readers of Jewish Baseball News to know? CH: I think people should know that if you’re not in the big leagues, baseball’s not as glamorous as people think it is. We’re not flying first-class on private planes with first-class service and food. We’re not playing in front of 50,000 people every night on beautiful, manicured fields and eating lobster and steak. We’re not making millions. We’re traveling on buses for anywhere from seven to 12 hours, staying in three-star hotels. We’re making 20 dollars a day meal money. Big leaguers make 100 dollars a day meal money. Obviously people have to realize when you’re in the minor leagues—definitely if you’re in independent baseball—you’re doing it out of love for the game. You just love the game so much. You don’t want to give it up, and you’re not ready to. I think that’s important for people to know, that just because you’re playing professional baseball doesn’t mean you’re a millionaire. It doesn’t mean anything. There are 17-year-olds playing professional baseball these days out of high school. They’re not millionaires. They’re just going out and playing a game. I also think for young Jewish kids, you have to have fun playing it or else it’s going to be a long, long season and a short career. Because if you’re not having fun playing the game, there’s no reason to be playing it. There’s way too much pressure and anxiety that goes into the game to begin with, because it’s pretty much a game built on failure, so you’re going to have to learn to control your emotions, control your mindset. Those are more important tools to the game than your actual physical ability to play the game. Millions of people have the physical tools to play the game of baseball. If you don’t have the mental approach to the game—that’s the big separator from a big leaguer to a minor-leaguer. The ability to make adjustments quicker. The ability to make the game slow down. To forget if you go 0-for-4 with four strikeouts and make two errors. Things like that. Tomorrow’s a new day. Every day. You just have to realize that. JBN: How do you do it? How do you block out the bad stuff? Haerther: You just have to go through it enough that you learn to. You’re going to have more bad days than good days in baseball. That’s just how it is, or else everyone’s going to be in the big leagues, and everyone’s going to be in the Hall of Fame. Obviously at a younger age it’s harder, but the earlier you figure out what your mechanism is to forget about yesterday, is the best. Confidence is probably the biggest asset you can have in baseball. You gotta fake it till you make it, too. You have to act like you have confidence all the time, or else you’re just not going to feel right in the batter’s box or out on the field, if you don’t have the confidence. For me personally, once I’m out of the stadium, once I’m out of the clubhouse, baseball is done for the night. I’ll watch TV, watch Netflix, talk with other people, consume myself with other things rather than just lying in bed and dwelling on the game the night before, the game that night. There’s nothing you can really do about it. I’m sure there are people in the big leagues who don’t read the paper, don’t do things like that, because most press is bad press. Unless you’re doing really well, they’re going to be saying something, especially in today’s big leagues, where people are making 20, 30 million dollars a year. I’m a big Dodgers fan. I love reading about Clayton Kershaw. He struggled a little bit to begin the year. This guy’s coming off three Cy Youngs, an MVP, and they’re bashing him. His last 10 starts he’s been unhittable again. Now everyone fell in love with him again. You never know what you’re going to get. JBN: Is that one of the lessons that fans should remember? To take a longer range view? Haerther: I believe that. Baseball’s a marathon. It’s not a sprint. You ask any coach, any minor-league director. It’s how you finish, not how you started. Anyone can get off to a hot start your first 20 games, but you have 140 more games. Just because you’re hitting .400 after 20 games doesn’t mean anything. It’s what you can sustain throughout the whole year, and that’s the hardest part, because when you get into August, September, you’re tired. Your body’s tired, your mind’s tired. What are you going to do to push yourself to that next level, to keep going, to sustain your batting average, your body, all that? I definitely think if you’re a true fan of baseball and a true supporter, you look at the season as a whole. What the player did from the beginning to the end, all the failures, all the strengths, all the winning streaks, losing streaks, all that. They all mean something. That’s really important. JBN: Last question, because you have to go hit. What would you like from fans? What is a good fan? Haerther: A good fan to me is someone who supports their home team, whether they win or they lose. I don’t understand booing your home team. Even in indie ball. We play 100 games, so 50 games are at home. They see us enough that they know our personalities, they know who we are. They’ll know if we have a good team that year or a bad team, really fast. Last year we had an incredible team, and they cheered for us for 50 games. This year, we’re not winning as much, so you’ll hear more boos. I just never understand why you’re going to go pay money to go see someone play a game and boo your own players. And the thing is, it’s not like any of us want to do badly. We don’t go out to the field and go, ‘Hey, we want to lose 20-2 tonight and go 0-for-4.’ No one wants to do that. That’s just the game of baseball. Sometimes good things happen, and sometimes bad things happen. A good fan will support you through the good and the bad. Look at the Cubs fans. They’ve gone a hundred and whatever years without winning a World Series. Now this year they’re playing well, and you see all the support, but they [always] fill up that stadium every day. They love their Cubbies. That’s a good fan base. I don’t like the bandwagoners. It’s like Los Angeles people saying all of a sudden they all like the L.A. Kings because they’ve won back-to-back Stanley Cups. Who in California watches hockey? Don’t be a bandwagoner just because your team is doing well. You should just go out, support them. I think they should get to know their players. If you’re at a smaller venue like the minor leagues or independent ball, you have the ability to get to know the players. It’s more intimate than the big leagues. You’ll find out we’re human beings. We have emotions and feelings. JBN: Is that okay for fans to come up and ask you questions and say hello? Haerther: Yeah. It depends on the player’s personality. I have no problem saying ‘Hi’ to a fan and talking with them for a few minutes before the game, but I guess you’ll never know unless you try.